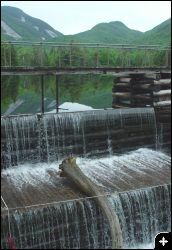 Marcy Dam is a place that becomes familiar to anyone who spends any amount of time hiking the High Peaks region. 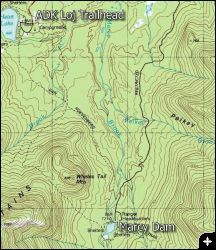 It is situated such that most of the hiking traffic starting from the most popular trailhead, at Adirondack Loj, must go over it. And, having visited it so often, I have many many pictures during every season of the year and for many different years. I thought it might be interesting to condense all of that into this one presentation. 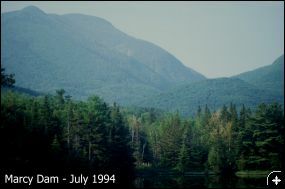 Below are a series of shots taken from roughly the same location, but during different seasons or years. 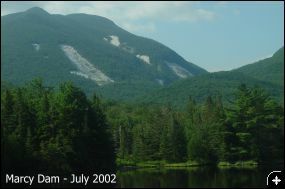 The two images above show how Mount Colden was affected by the wrath of Hurricane Floyd during the fall of 1999. Many new landslides occured on the northwest flank of Colden, including one which wiped out a section of the Avalanche Pass trail.